Download our free, 300-page workbook and handbook, the Professional Event Planning Guide. In this guide, five event pros from all ends of the spectrum — corporate meetings, boutique conferences, high-end agencies, and association events — weigh in on running an event from start to finish. What’s in the Professional Event Planning Guide? We worked with five top event professionals who love to break boundaries, set aggressive goals, iterate year over year, and listen to their attendees. Measure twice, cut once — prep pays off! In this section of the guide, we’ll show you how to build out your team. What does the ultimate event team look like? How can you work with volunteers? Use our project plan template to keep contributors on track. This part of the event planning guide details how to be smart about choosing a date, gives you a checklist of questions to ask before you book a venue, and lists tips for cutting costs. This itemized workbook-style budget covers all your bases! How can you juggle the need to start promoting with the complexity of confirming the framework? Flip to this part of the event planning guide and we’ll show you what you need to start sharing, and what you can leave ‘TBD’. Looking for tips on finding and booking a really fantastic keynote speaker? A great speaker can set the tone of the entire event, increase message lifetime, and set you apart from other events. It’s a no-brainer. Save money by moving to mobile, and learn how to generate revenue and elevate your event’s brand by going digital. It’s crazy easy! Guidebook even lets you get started for free. This crucial element of event planning can make or break your event. 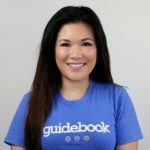 This chapter of the event planning guide shows you how to set up your event registration system, how to test it, and best practices for landing pages and forms. What should you choose? Who should you ask? Which confusingly-designed government websites should you scrutinize? Find out in this section. Telling your story to boost registration. This is practically why we wrote the event planning guide. Learn specific tips for getting the most out of email, phone calls, digital ads, social media, PR, partner promotions, referrals and more. With specific tips for email timelines, the importance of an event hashtag, and a checklist for PR and the media. Low registration? Here are some emergency tips. Find a troubleshooting handbook, fresh offers, ways to create urgency, and even questions to ask yourself to determine if you’re saying the right things for your audience. Know the venue inside and out. This crucial element of the event is your chance to make a first impression. How to deal with complex parking, attendee flow and more. Get the event planning guide for this imperative checklist of final prep and the team debrief. You don’t want to face “five minutes to showtime” without it! Your hard work is about to pay off! Learn to keep an eye on transitions and traffic patterns. How to handle real-time guest feedback for maximum follow-through. The event planning guide has your back as you move throughout the space, put out fires, set different fires, and handle a thousand requests while maintaining a super-cool demeanor. Your event’s influence goes beyond the walls of your venue. You have the opportunity to convert your attendees into fans–and to get your fans to spread the message! It’s your event planning guide to stellar social. You’ve closed the doors. What happens next? Your guide to saying thank you at the right time, and the delicate dance of collecting sponsor pledges. Here you go — a step-by-step event planning guide to sharing the info attendees need after the event has ended, keeping them interested in the messages you’ve shared, and getting them talking for a long, long time. If you’re like our five amazing event pros, you evaluate your successes and failures to produce better events time after time. Here’s an in-depth workbook detailing everything you need to look into: How were your attendance, revenue, marketing, attendee/sponsor satisfaction? We worked with industry stars and wrote the Professional Event Planning Guide so you don’t have to. Get the guide now by clicking below – it’s free!